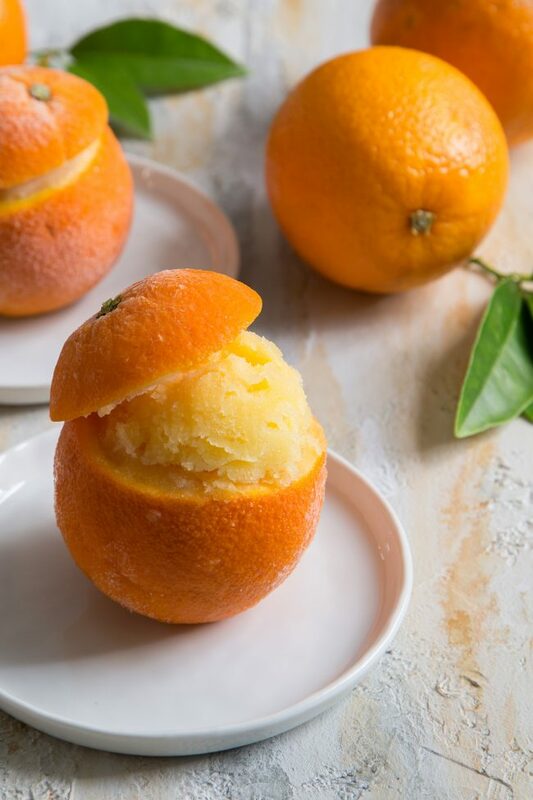 This super easy three ingredient orange sorbet only requires fruit juice, water, and sugar. It doesn’t get much easier than this. Three ingredients and an ice cream maker. Don’t fret if you don’t have an ice cream maker. This recipe can also be used to make granita. Growing up, I thought orange sorbet served in an orange cup was the coolest, most sophisticated dessert ever. I used to order it all the time at a local Thai restaurant. Unfortunately, I don’t see it on the dessert menu at many places anymore. I still think it’s an awesome dessert and a perfect way to end a meal. I used cara cara oranges for my vessels. 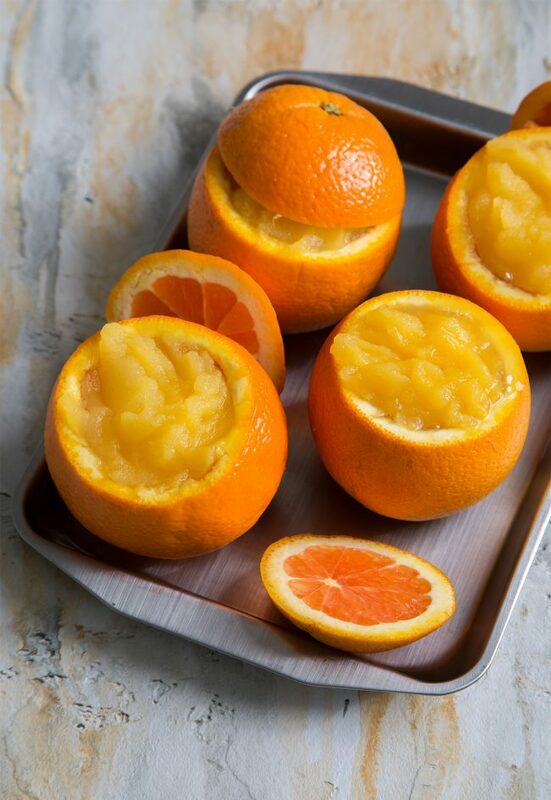 Slice off the top third of the orange. 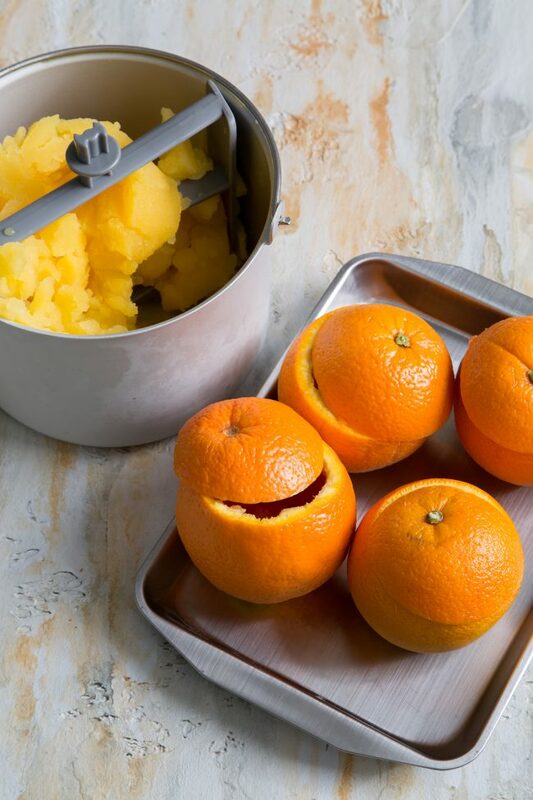 This allows you to fill the orange with more sorbet. Use a knife or grapefruit spoon to scoop out the insides. I highly recommend this compressor ice cream maker. I’ve had it for a few years now and I absolutely love it. Unlike other ice cream makers that require you to freeze the mixing bowl ahead of it, the compressor chills the mixing bowl as it spins. That means no extra prep work needed. You can make ice cream whenever the craving strikes! Straight out of the ice cream maker, the sorbet will be rather soft and loose. You can enjoy it at this point, or let it firm up in the freezer for a couple hours. 90 minutes to 2 hours is the sweet spot in my freezer. At that point, the sorbet is creamy yet firm. 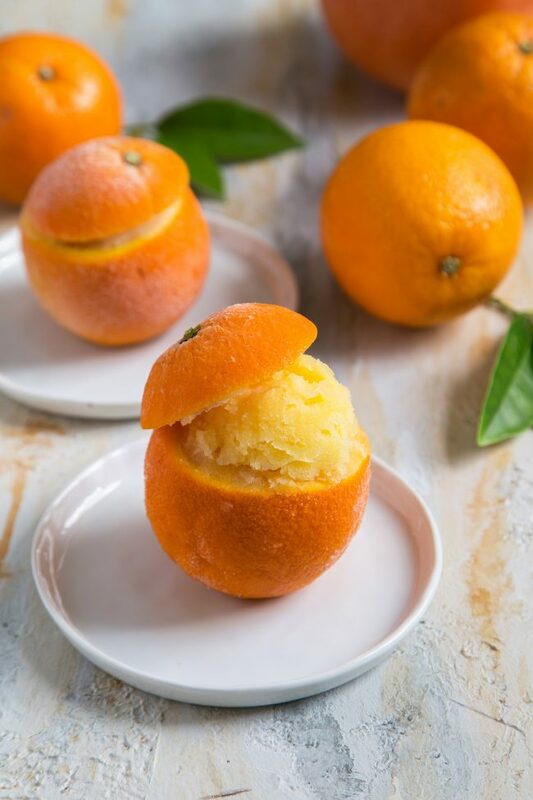 If you freeze the sorbet for longer, it will definitely be harder. You can also adjust the consistency of the sorbet by playing with the amount of sugar in the recipe. More simple syrup will result in a silkier, creamier sorbet. Less simple syrup will create an icier texture. If you’re feeling fancy and adventurous, this would make fabulous slushie mimosas! It’s on my to-do list this summer. Mix together orange juice and simple syrup. Freeze mixture in ice cream maker according to your unit's instructions. 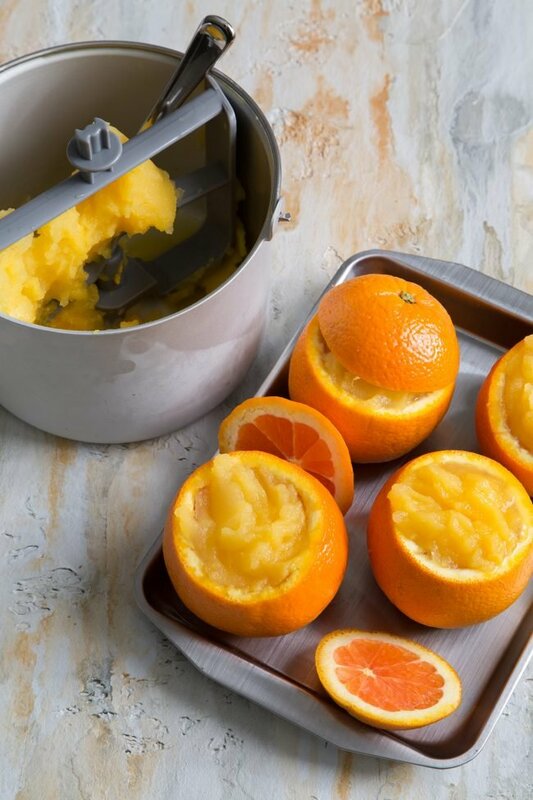 Once the mixture has reached a soft serve consistency, transfer mixture inside hollowed oranges or into a freezer safe container. Let chill in the freezer for 2 hours to firm up. At 2 hours the sorbet will be a soft consistency, perfect for scooping. Freezing the mixture overnight will result in an icier texture. 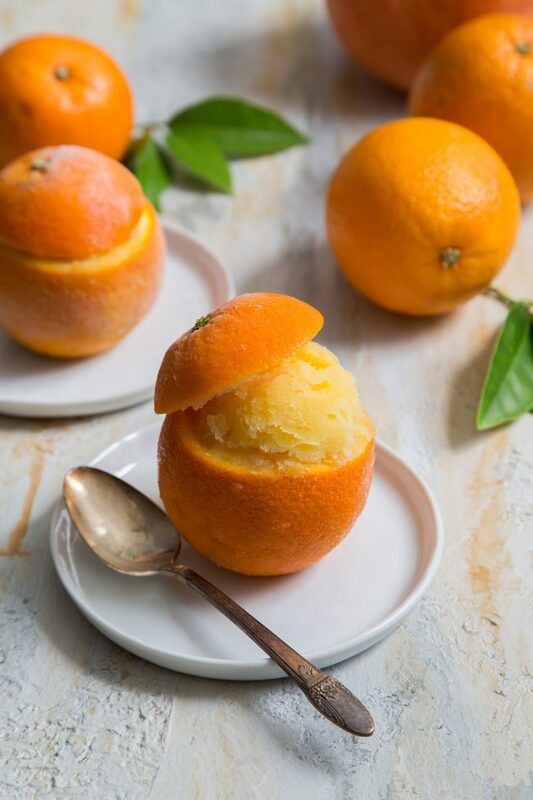 Allow the orange sorbet to soften slightly before serving. To make simple syrup: bring to a boil equal parts water and sugar. Heat until sugar has dissolved. Cool to room temperature and keep stored in the fridge until ready to use. Will keep in the fridge for several weeks. If you want a silkier sorbet, add additional simple syrup to the recipe. The higher the amount of the sugar, the creamier the sorbet will be. Less sugar will result in an icier texture. I use this compressor ice cream maker. It is more expensive than the more common ice cream machines because it does not require the pre-freezing of the mixing bowl. Mmmmmmm… this looks like the PERFECT summertime treat. Sitting by the pool with a cup of fresh sorbet sounds like heaven right now! So refreshing! I can’t wait to dig in right now! I love how simple this is and the presentation. That will be cute to serve for a dinner party! So cute and I love the simplicity of the ingredients. Time to dust off the ol’ ice cream maker…!